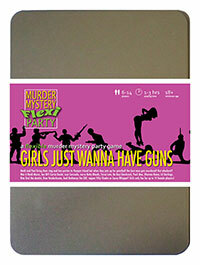 You've been invited to play the role of Heidi Marns in Girls Just Wanna Have Guns. Heidi and Paul are throwing their pre-wedding parties at luxury spa and adventure resort, Pamper Island. But after one too many drinks, the bride and her entourage are invited to 'hunt the stag' with paintball guns - and best man Steve Wingman meets a grisly end! Can you find out who murdered him? Grab your guns and get ready for a facial at the luxury spa and adventure resort of Pamper Island! Most nights, your ‘friends’ force you into wearing a seriously short lacy wedding dress with matching veil but if you’ve had enough of that, wear anything you like with a garter - you are the bride-to-be after all. Working in a premium-rate call centre, with a stutter you’ve had since birth, was always going to be a challenge. But on the day you decided to quit, Paul phoned in and set your heart alight. Even though he was complaining about a mini chainsaw that wouldn't switch off, he was so kind and gentle about the whole thing, especially since he was receiving stitches in A&E at the time. You fell in love with his voice and kept working in the same place so you could listen to him ‘complain' on a daily basis. When you finally met in a McDonuts just off the A41, Paul proposed by hiding your ring in a pink cinnamon hole. How romantic! I know that as the bride-to-be you probably think I’m happier now Steve is out of the way but it’s not true. When Steve played with Paul I got to play with myself. All this is giving me the pre-wedding j-j-jitters. Which isn't helping my usual st-st-stutter. Anyway, I was looking for Paul all night so I could protect him from paintball pellets. I didn’t find him till the end and didn’t see Steve either. So you can all just f-f-f-find someone else to blame.